If you need the perfect piece to display your pens, this Anonymous/Parker counter top display case, circa 1920, is fully operational and quite interesting, although the case and trays are a little threadbare. The rear door is hinged, unlocked, with no key. 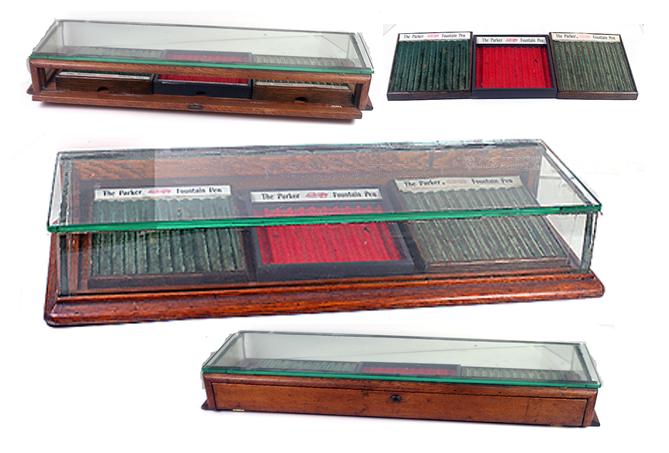 This display case measures 25 ½” x 9.5″ x 4″, and has three wooden trays – two vintage and one more modern reproduction. All have the ”Parker Lucky Curve” reproduction label. A great piece to add to your desk, your collection, and to keep your pens organized and safe! Not to mention well-displayed, in classic style. Item #25 in Catalog #77 – available! This entry was posted in Vintage Pens and tagged Anonymous, Ephemera, Parker. Bookmark the permalink. Follow any comments here with the RSS feed for this post. Post a comment or leave a trackback: Trackback URL.